Upon arriving in France for D-Day landing celebrations, Russian President Vladimir Putin and UK Prime Minister David Cameron met at a Paris airport to discuss Russian-UK relations and Ukraine. 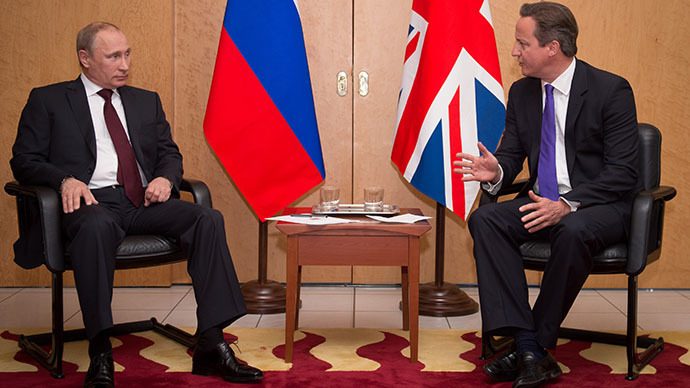 The leaders reportedly avoided a pre-talks handshake. Putin and Cameron on Thursday met at Paris’s Charles de Gaulle Airport, where they arrived ahead of celebrations marking the 70th anniversary of the WWII allied landing operation against Nazi Germany. Despite the cold start, the talks went on according to etiquette, with Putin and Cameron shaking hands “not on camera,” Kremlin spokesman Dmitry Peskov said. Earlier on Thursday, Russian Foreign Minister, Sergey Lavrov, and US Secretary of State, John Kerry also met in Paris for Ukraine-dominated talks. While Putin and Cameron were holding the tense airport talks, US President Barack Obama and French President Francois Hollande were dining at the luxurious Chiberta restaurant in central Paris. Putin then proceeded to the city’s Elysee Palace, where the host – Hollande – heartily welcomed him on camera. The French President planned two separate dinners with US and Russian leaders, reportedly as part of diplomatic efforts to defuse the tension over Ukraine.